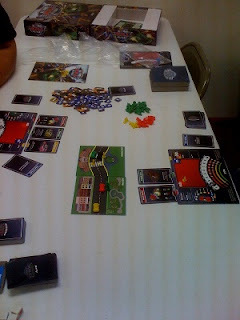 An interesting new game that I played this week was Road Kill Rally . In Road Kill Rally, the players are participating in a "death race" where it is not only important to finish first, but it is also important to take out pedestrians and the other racers along the way. On each player's turn, they will have the option of slowing down or speeding up, then they move along the track (attempting to hit all of the pedestrians in the way), and finally they can attempt to shoot at the other players if they are within range and can get a clear shot. One of the biggest pro's of Road Kill Rally is this: it is fun. Whereas there are lots of different things that can be said positively about a game, saying that a game is fun is one of the highest compliments that I can give to a game. Similarly to Pirate's Cove , Road Kill Rally is a game that is enjoyable to play whether you win or lose. With that said, Road Kill Rally is not especially strategic. This will be a con to lots of people. The game winner will be determined at least as much by whoever can roll dice well at the right time as it will by whoever had the best strategy. Every element of the game is determined by die rolling - shooting at other players, running over pedestrians, and even wiping out on oil spills. Another thing to note about Road Kill Rally (not a pro or con) is the following - there is an alternative "elimination" mode that can be played. From what I have seen, this mode looks like it may be the preferred method of playing a 6-player game. If you do not play in the elimination mode, then the game can last a little longer than desired, especially the first time through when players are just understanding the rules. Speaking of length of time to play brings up another pro - the time is adjustable. There are a certain number of road tiles that are played, and you play until people cross the line with the finish line on it. For a shorter game you can easily move the finish line further up in the stack, and for a longer game you can move it down. Another aspect of the game that I am undecided about is how the damage works. All of your life total is determined by the number of "Rally" (action) cards that you have in your hand. If you are dealt damage, then you give your cards to your opponent. You also use your cards as ammo for your weapons, and for other actions during your turn. This means that to perform most of the actions in the game, you must actually harm yourself. The good side of this, however, is that it gives the game a balancing effect in that you must carefully determine if you're going to use your last cards to power your weapon or whether you will keep them in an effort to avoid wiping out. Overall, I give Road Kill Rally an 8.0/10. This game (as stated previously) is fun. You should try it. I believe that it is the best racing game that I have played. Just know going into it that strategy won't win you the game - shooting your opponents and rolling dice well will win the day.